Buried at BERLIN 1939-1945 WAR CEMETERY, Germany 9. G. 8.. Aged 19. 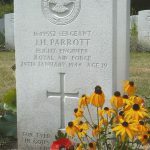 Son of Ernest James Harrison Parrott and Lucy Margaret Parrott, of Brandon, Suffolk. James was born in the spring of 1924 to Ernest and Lucy (nee Holmes) Harrison. By 1941 he was serving in the Royal Air Force as a Flight Engineer on a Halifax Mk2 bomber, as part of 419 Royal Canadian Air Force. The squadron had been formed just down the road, in Mildenhall, during 1941, but on the ill-fated day of 29th January 1942 the squadron was flying from R.A.F. Middleton-St.-George, County Durham. By that time James’ crew had completed ten uneventful but successful missions in the previous four months. On their eleventh mission it became very serious when they received damage from heavy flak over Magdeburg. 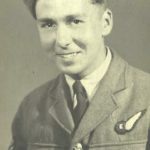 James’ twelfth mission started just before midnight on 28th January 1944, when James’ aircraft was one of fourteen to take off, as part of a huge bombing raid of over six hundred aircraft on industrial targets in western and southern Berlin. At 03.20 hours of the 29th January, his aircraft was shot down about 22 miles north-west from Berlin, near a place named Zuhlen, resulting in the loss of life of all eight crew on board. Forty five other allied aircraft were lost in that raid. James’ and his crew were buried in a mass grave. All were listed as “unknown” airmen. On 6th June 1947, his body was exhumed and re-buried at a war cemetery in Berlin, although only six of the eight could be positively identified. James’ name is also is commemorated on a wall mounted plaque in St Peter’s Church. He was just 19 years old. My grateful thanks to Robert Carman for many of the images and information. 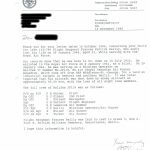 Robert sent me a copy of a letter that the Ministry Of Defence had sent in relation to one of James’ crew. It lists the crew and also gives a couple of details about their final flight.